Download layout and schematic files. Order boards and parts. This is the place for ordering kits, boards, and parts for various projects featured on my web site. Please send me an email (Richard Murdey, rjm003.geo@yahoo.com) listing what you want, and I will send you a Paypal invoice for the total. 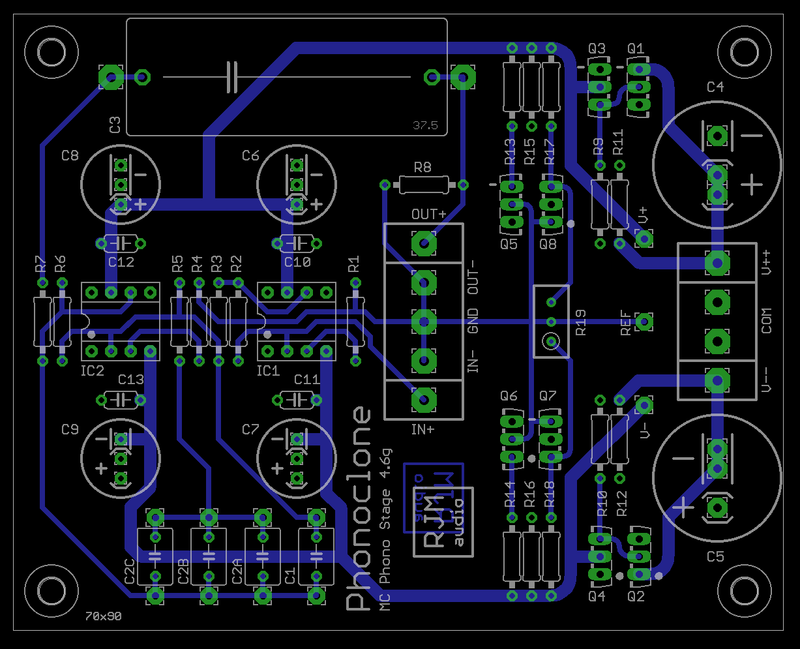 Kits include the boards, instructions, and all the parts to complete the boards. Generally, you need to supply a transformer and diodes, as well as the chassis, connectors, wiring, volume control, etc. Boards just ship as bare boards. I only accept Paypal payments. Prices are in US dollars and listed below. Shipping is free. The parts lists for each project are available as a spreadsheet file (Excel .xlsx) which you can download below. They normally have a pre-formatted BOM (Bill Of Materials a.k.a. a parts list) you can import directly into your shopping cart at Mouser. These spreadsheet files also contain schematics, worksheets and other useful information. To open the .brd and .sch files you will need to download and install the free Eagle Layout Editor software. 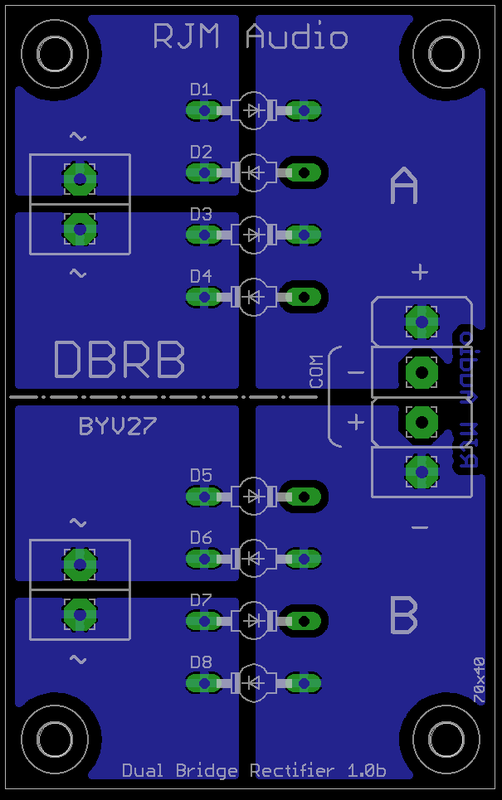 You can use the .brd files to make your own boards if you want. Just two rules: don't pass them off as your own work, and don't use them for commercial gain. I've written a construction guide for the phono stage projects, with details of the power supply and connections. Problems? Questions? Email (address above) or check out the VSPS and Phonoclone Help Desk or search the related forums at diyaudio.com. As well as being a valuable general resource, there are many threads there concerning the projects featured below. I also have a blog diyaudio, and maintain a Google+ page. For low and ultra-low output moving coil cartridges. 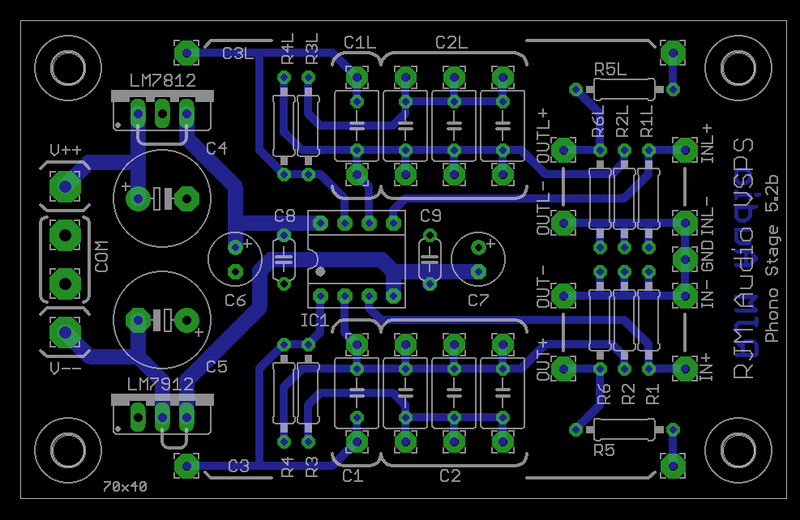 Single channel, dual-layer 10 cm x 8 cm board. Two boards are required for stereo. The S-Reg voltage regulator circuit is built in to the boards, no additional regulation or filtering required. Boards only (set of 2) $25 / Kit $150. 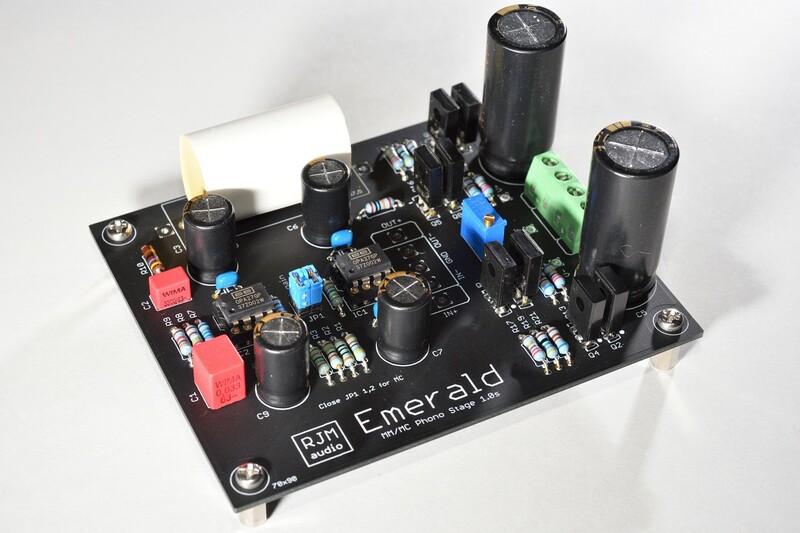 A two stage op amp circuit, the Emerald has switchable voltage gain and loading options and features an active-passive hybrid RIAA with exceptionally accurate response. 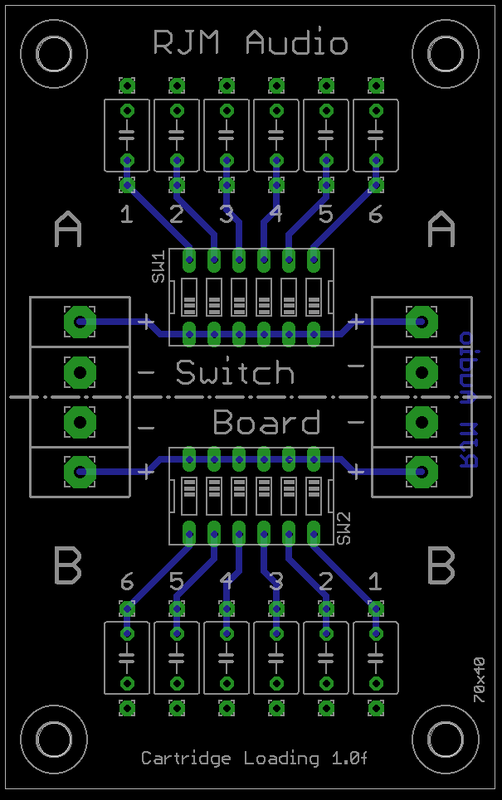 Single channel, dual-layer 10 cm x 8 cm board. The S-Reg voltage regulator circuit is built in to the boards, no additional regulation or filtering required. Boards only (set of 2) $25 / Kit $150. 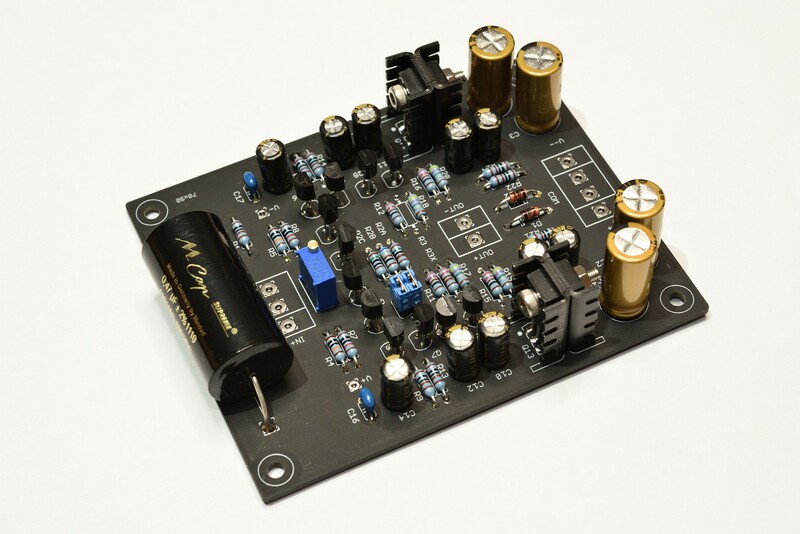 This small 5x8 cm board provides additional cartridge loading options for a phono stage with fixed input resistance like the Emerald or VSPS. Board only $10 / Kit $30. 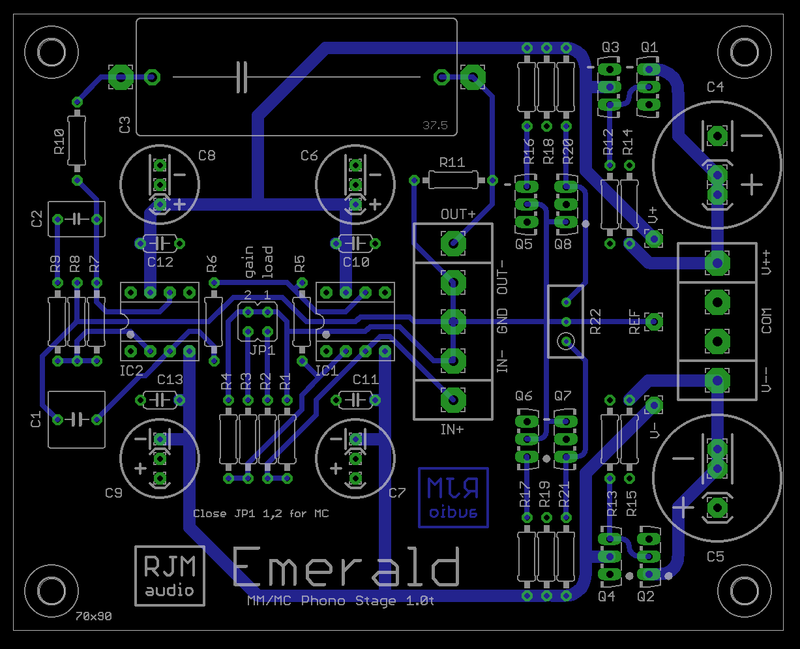 Headphone amplifier or line stage. 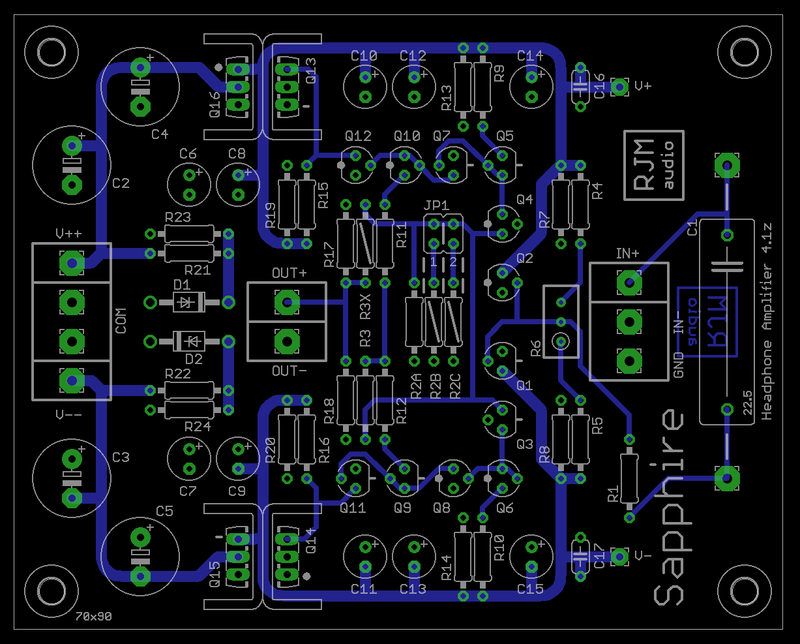 The Sapphire is a fully discrete, all solid state current feedback amplifier circuit with Z-Reg voltage regulator circuit built-in. Provides low distortion and excellent drive characteristics. There is the option of switchable gain settings and the output buffer can be configured to run open loop or closed loop. Boards only (set of 2) $25 / Kit $150. 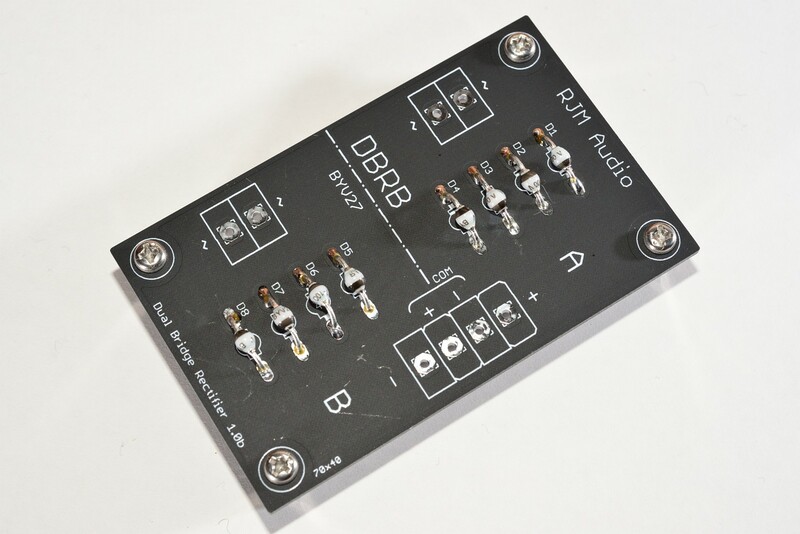 A 5x8 cm board which conveniently holds 8 rectifier diodes, with output for split rails or dual supply. Board only $10 / With 8x BYV27-100 diodes $15.